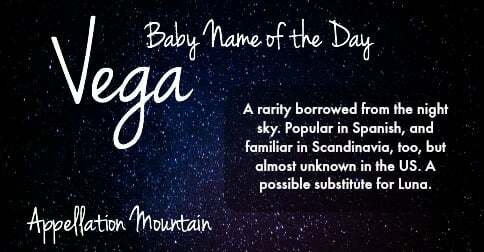 It’s a nature name starting with that stylish letter V.
Our Baby Name of the Day is Vega. If you know Vega, maybe you’ve been stargazing. It’s not just any star, either – it’s the brightest star in Lyra, and the fifth brightest star in the night sky. This is still a nature name in Spanish, but it’s found on terra firma. In Spanish, la vega means the meadow. Las Vegas is known for gambling and general excess nowadays. Back in 1829, a group of traders encountered the Las Vegas Valley on their way west to California. A combination of wild grasses and desert springs made the place a much-welcome oasis, and the pretty, poetic name was chosen accordingly. Before you write this one off because of its ties to Sin City, consider a very different association with the name. In Spanish, Mary is called Nuestra Señora de la Vega – Our Lady of the Meadow. A basilica dedicated to Our Lady of the Meadow stands in Rioja, Spain. So not only is Vega tied to Nevada’s most scandalous city, it’s a Marian name, too. How’s that for a split personality? It’s popular in Spain, too. Singer-songwriter Mercedes Carpio, known professionally as Vega, first hit it big in the early 2000s and might be part of the reason for the name’s rise. This generation of parents might have another thought when they hear Vega: Pulp Fiction and Reservoir Dogs. The Vega brothers appear in the movies: Vic in Reservoir Dogs and Vincent in Pulp Fiction. A character from the video game series “Street Fighter.” He’s a bad guy in a matador get-up. Don Diego de la Vega, the fictional character better known as Zorro. Created by Johnston McCulley back in 1919, Zorro remains well-known, with actors from Douglas Fairbanks to Antonio Banderas playing the role. Nickelodeon’s Victoria Justice starred in the sitcom Victorious as aspiring singer Tori Vega. It’s been use as the name of an airplane and at least one automobile, too. Science fiction writers have borrowed Vega. Carl Sagan used it in Contact, and Isaac Asimov made it the name of wealthy province in the Galactic Empire. In China, the star is associated with a legend about Zhin, the weaver girl. Zhin fell for a cowherd, represented by Altair – another star in the night sky. 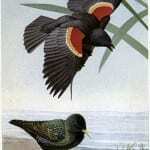 The pair had a Romeo and Juliet-like romance, separated by a river. Once a year, the stars come close in the night sky, and the Japanese celebrate the traditional Tanabata festival. There are more stories – and dozens of variations on the tale. But it lends the name a romantic aspect. 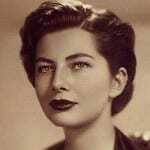 There have been a handful of girls given the name, in India and Scandinavia and the US, too. In Sweden, it was most popular in the early twentieth century, apparently inspired by the star’s name. This tracks with early use in the US, too. Danny Wood of New Kids on the Block has a daughter called Vega. In 2014, there were 22 girls and 10 boys named Vega in the US – rare, but not unknown. 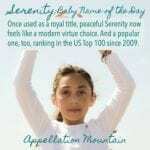 Overall, it’s a modern, edgy name with ties to global cultures and the natural world – a great choice for parents intent on something different and distinctive. What do you think of Vega? Too spacey, or 21st century perfection?